Amber, girl, is that you? Last Sunday, Amber Rose was seen wearing a long brown wig in Hollywood with her best friend Blac Chyna, who herself wore an eccentric blue wig to match. Known for her bleached buzzed style, we were surprised to see Rose with dark locks down to her waist! 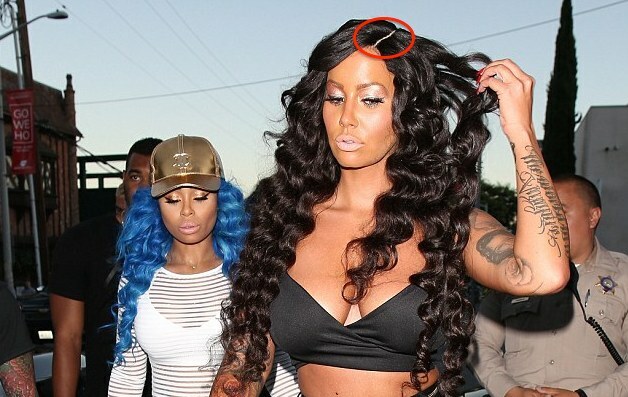 While we think her look is A+, we just wanted to know… what’s with that wig? The hair itself looks great, but if you look closely at the part, you’ll notice her “scalp” doesn’t match her skin tone at all. Although we know wearing the wig was all in good fun and how important hair versatility is, we would think the part would be a lot less noticeable. Maybe it was the flash of the camera that highlighted it a bit too much? Check out the picture below to check it out. Either way, we are a big fan of Amber Rose and her style, not to mention her wonderful feminist work. If you ever need hair Amber, feel free to give us a call! This Alopecia Awareness Month 2015 We Ask, Would You Change Your Life If You Could?